On a whim, I checked out MIDDLE SCHOOL IS WORSE THAN MEATLOAF from the school library. It disappeared from my desk immediately and has been making the rounds among the girls in my homeroom, who begged me for another book like it. 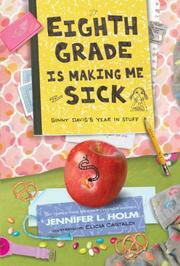 I am so excited to be able to offer them EIGHTH GRADE IS MAKING ME SICK, a fantastic sequel about Ginny Davis. Told through the ephemera of a young girl's life (IM chats, notes, report cards, etc. ), we learn a lot about Ginny's rough year. Between her stepfather losing his job, her brother's constant trouble with the law, her mother's unexpected pregnancy, and a mysterious illness, Ginny has a year that I wouldn't wish on anybody. While there are many setbacks in the book, the tone remains hopeful and sweet. The girls in my homeroom are going to love this book, and will be eager for the next addition to the series.